Two people have been taken to hospital after a crash in the Prestbury area of Cheltenham on Friday 20 April. A bus crashed into the side of a house. 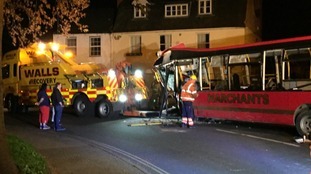 It's reported that the driver has been taken to Southmead Hospital and is in a serious but stable condition. Another person has been taken to Gloucestershire Royal Hospital. The owner of the house was not at home during the incident. Police are investigation the cause of the crash. A cyclist has been killed after being hit by a car in Prestbury. The 48-year-old Cheltenham man sadly died at the scene after a silver Mazda 3 collided with him. Police are appealing for any witnesses to the crash to get in touch, it happened just before 9pm on Friday (16/06) at the Priors Road junction with Bouncers Lane. A 22-year-old man and 23-year-old man, both from Cheltenham, were arrested on suspicion of dangerous driving and remain in police custody this morning. Another silver or grey car is believed to have been in the area at the time and police are keen to hear from the people who were in that vehicle. A war memorial in Prestbury near Cheltenham has undergone extensive restoration after being wrecked by vandals. There was outrage when the monument was smashed to pieces last autumn. Stonemasons gave their time and materials for free to cover estimated repair costs of £15,000. Ken Goodwin reports on a war memorial which was vandalised last year has now been re-carved by stonemasons. The memorial, at Prestbury in Gloucestershire was wrecked last October. It would have cost thousands of pounds to put right but a masonry company from nearby Stonehouse offered to rebuild it.